No one has ever discussed such a legendary person. But this artist has the right to much, at least for such a small story. Fame came to him too late at forty-seven, but this was not at all because he wanted it so much, but because the fate was ordered. Tropinin is not an ordinary citizen of the Russian Empire, he was a serf, the son of a serf. True, he was still free when he was still young. But only him, not his whole family. He had to give up liberty and again serve his master. True, with one, but… he could leave at any time. But then he was lucky, one of the owner’s relatives noticed the guy’s passion for art and suggested trying to enroll in an art school. What, in general, and happened, he learned there. But the continuation did not work out: in the estate of the master, his father dies and the future genius is called into the estate, to take the post of father. And the post was not easy – the manager of the estate. The estate was in Ukraine, so the guy for a long time forgot the everyday life in the capital. And only with the transfer of owners to Moscow, his fate has changed dramatically. He finally gets a real liberty, along with his family and here it is, as they say, burst. In Ukraine, he did not leave his skill – he made sketches, painted portraits of peasants and owners. Yes, and he arrived in Moscow is not empty-handed. He presented to the Academy three of his great canvases – “Lacemaker”, “Beggar Old Man” and “Portrait of Skotnikov.” For these submitted canvases he was erected as an appointee. And when he presented another portrait, he was given the title of academician. This is taking off! For his creative destiny, the artist executed more than three thousand portraits. Three thousand!!! No wonder he entered the golden age of our Russian painting and his canvases are the pearls of Russian art. As for the self-portrait itself, that is, this is a bit of vanity and gratitude. He was given his freedom, he was given the opportunity to go out to people with his talent. 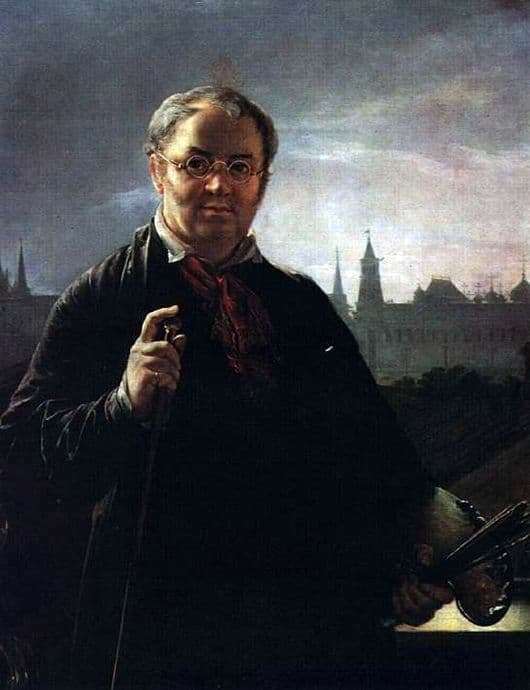 Yes, he stands against the background of the Kremlin, but in his hand he has his work tool, which he did not throw until the last minute of his life – a palette and a brush.